Those with a fancy for traditional Japanese art and popular video game heroes, this gallery is just. For. You. 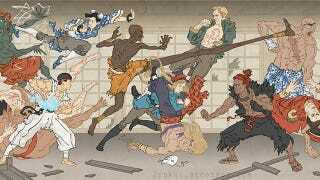 Artist Jed Henry has been doing this series - called Ukiyo Heroes - for a while now, but he's finally got enough of them together to run them as a collection. The name derives from Ukiyo-e, the Japanese term for a type of woodblock prints that were so popular from the 17th to the 20th centuries. Only, instead of featuring landscapes, Henry's pieces feature people like Mega Man and Mario. He's promised to do more of them all through the summer, so bookmark the link below if you like what you see.